Caribbean Lifestyle Media-And only one can be a winner! 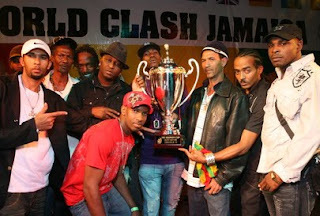 This echoed loud and clear as Black Kat Sound system claim the top position in the decade long competition, better known as the ultimate championship in Sound Clash. The World Clash cup was renamed the Squingy Cup after Bass Odyssey's Squingy read more below courtesy of Irish and Chin. Irish and Chin-After an intense early warm by Barrington Levy's sound Black Roses, Olympic and Dexter Peppa, the swollen crowd of diehard sound clash enthusiasts were hype for the war that lied ahead between Mighty Crown, Bass Odyssey, Bredda Hype, Sentinel and Black Kat. Although round one was just a preliminary round, it was a bit indicative of what would happen through out the night. Despite being alligned with heavy dub plates from top dancehall artists, most of the sounds had lukewarm performances, scoring intermittent forwards. Indisputably, it was Sentinel that stood out as the star sound of the night from early. Led by their new mic man Shotta Paul, Sentinel went in hard, earning the most forwards and crowd response in round one. When Sentinel hit the stage, the clash became lively as they advised their contenders and the audience "people...Jamaica is not for sale." Sentinel became a hard act to follow. If there was a winner of this round, it would have been Sentinel. During round two, which was an elimination round, the sounds realized that Sentinel was a force to be reckoned with. With this in mind, the sounds increased their efforts. Mighty Crown paid their respect to Squingy during this round and went on to make a comedic speech about Sentinel. They later played a Vybz Kartel dub that was well received by the crowd, allowing them to have a strong close. Bass Odyssey followed with an improved round. The sound, which featured both Worm and Dameion on the mic, spoke of their fellow sound man Squingy with pride.